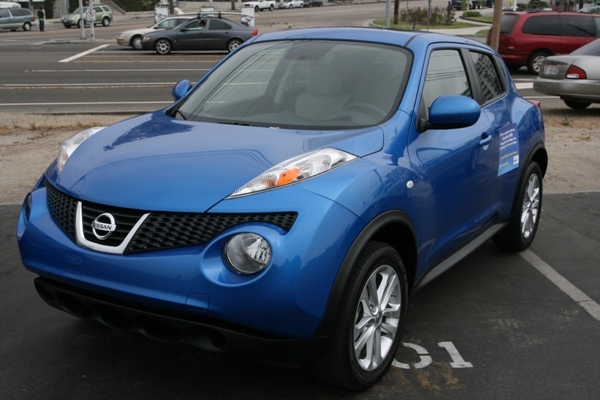 We recently got a chance to test drive the 2011 Nissan Juke as part of the Juke Drive LA event, and the little car has quite a bit to offer. First off, the 2011 Juke is sporty as hell. It’s one of those small crossover cars that make up one of the fastest growing segments in the auto market. The Juke has the sleekness and maneuverability of a sports car, but it still has the utility and frame that you’d expect from a compact SUV. It’s like a mini Cooper with balls. The car’s appearance is what strikes you first. It has a wide stance, the outward appearance of a much larger car, these funky, boomerang-shaped taillights and a uniquely athletic front grill. The sculpted interior includes a center console that was modeled off of a motorcycle, a pretty decent stock sound system (with front tweeters and a Rockford Fosgate subwoofer in the back) and an easy to use, climate/drive control interface that allows you to control the AC and select between three different drive modes (normal, sport and eco). The Juke also includes an optional navigation system on a five-inch color touch screen display and connection compatibility for iPod, Bluetooth and USB. The Juke has a little kick to it too. The 2.5L engine offers drivers 188 horsepower and 177lb-ft of torque. The Juke can round corners well, crush U-turns with ease and accelerate quickly off the line. It’s a four-door, compact city car that’s fuel efficient (27 mpg on the city and 32 mpg on the highway), easy to park and gives you extra cargo space when you need it (35.9 cubic feet of cargo space with the rear seat folded). The Juke S starts at $18,960 for the S CVT FWD model ($20,460 for S CVT AWD). The SV model includes a moonroof, the I-CON Integrated Control System, USB port and premium cloth. The SV models range from $20,260 (for the SV MT FWD) to $22,260 (for the SV CVT AWD). Even if you get a fully equipped JUKE SL CVT AWD, which includes leather seats and a bunch of other goodies, the asking price starts at under $25,000 ($24,550 to be exact). If you’re the kind of person who likes classic looking cars with timeless appeal, you’re not going to love the funky stylings of the Juke. The Juke is for characters. It’s for people who buy Scions and Elements and Mini Coopers and cars with personality and flair. If you like character cars that combine utility and affordability with decent performance and style points, the Juke is worth a look. Full Disclosure: The fine people at Nissan showed us an amazing time that included a scavenger hunt through LA, free sunglasses, Amoeba gift certificates (which we quickly spent on soul 45s, Bar Kays vinyl and this sweet German disco-funk compilation) and a free lunch at Galdstone’s (which I couldn’t finish). We also got to hang out with some great folks! Print article This entry was posted by Chris Stout on September 28, 2010 at 11:16 am, and is filed under Lifestyle. Follow any responses to this post through RSS 2.0. Both comments and pings are currently closed.